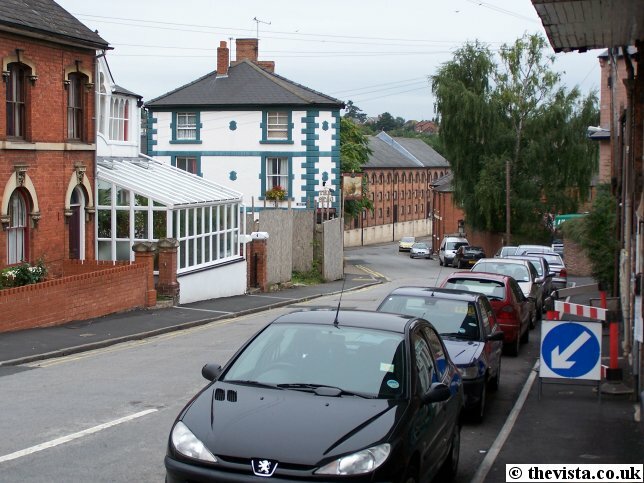 Henry Street, Ross-on-Wye, runs north - south from Station Street running up hill to where it joins Cantilupe Road and Gloucester Road. Henry Street was one of the last streets to be developed in Ross and has never had a great deal of industry in it. 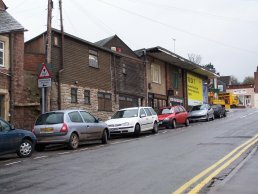 The east side was taken up by the Board School (now demolished and replaced by the town library and some housing) and the west side was taken up largely by the Malt House of the Alton Court Brewery. 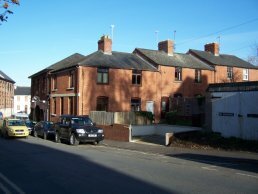 This is the view down from the corner with Cantilupe Road down past The Stag Inn (the white building on the left) and in the distance is the site of the Malt House. This is Cantilupe House is one of only a few houses on Henry Street. 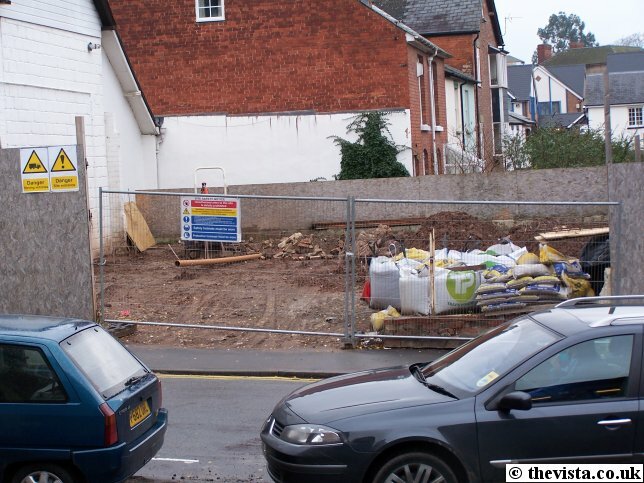 The green gates were the entrance to Scimitar DIY store which explains the strange 'sword' on the gates. 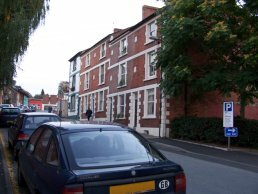 (Note: This space has now been developed into housing) This building is currently Wye Electrics shop and previously to that it was Scimitar and before that, in the 1980's, it was a vetenary surgery. 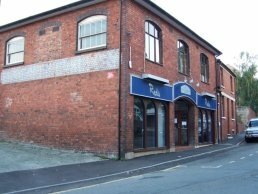 During the 50's and 60's it was Goldings ironmongers, which was thought to have been a firm from Hereford, and during WWII, the cellars were used as a A.R.P. post and as an air raid shelter. 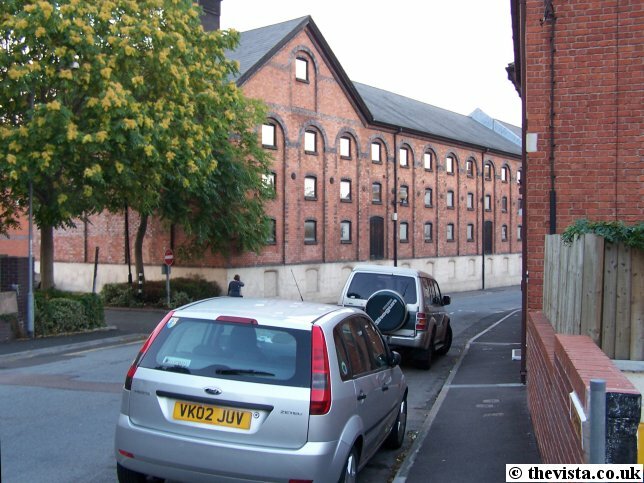 Originally, in the late 19th century, it was the site of Casson's carriage works as mentioned here. Cantilupe House looking back up the hill. The houses have quite a bit of intricate carving at the ends of the arches over the windows and on the key stone at the top of the arch. 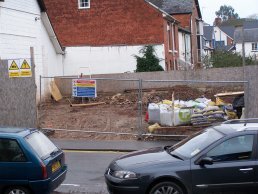 This boarded off development area on the opposite corner of the Crofts lane from the Stag, used to be a building that was occupied by Barter Bros. The Barter Brothers where carpenters and joiners and they also owned Cantilupe House that is next up the street. 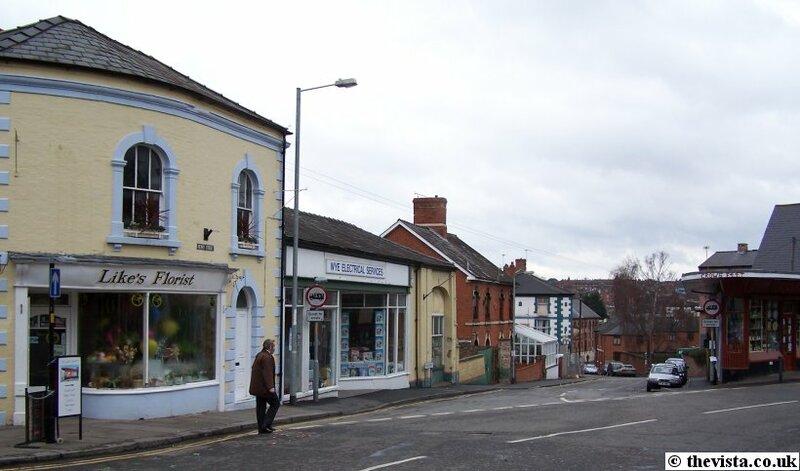 These are some of the few shops on Henry Street. They are built under the shops that line Cantilupe Road. 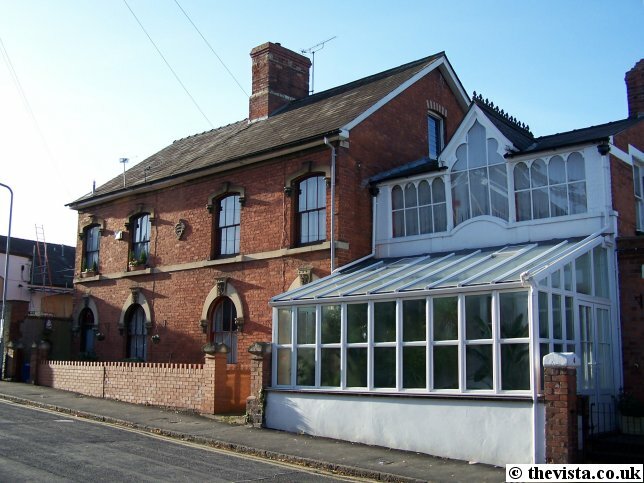 This is the back of the Chapel (that is now the registry office in Ross) that fronts Cantilupe Road. 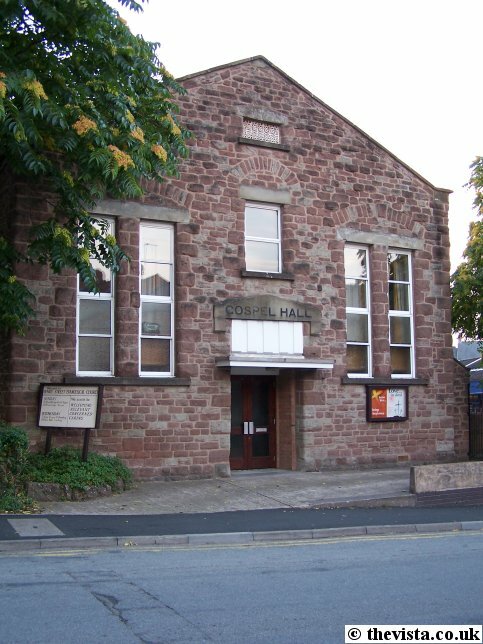 It was marked on a 1887 Ordinance Survey map as a Baptist Chapel. In the 1950's this used to be the Magistrates Court in Ross. The door you see in the middle of the building used to be the entrance to the holding cells which were in the small extension on the back seen here. This was where the prisoners were held until they were taken up into the dock to face the judge and returned after sentencing. 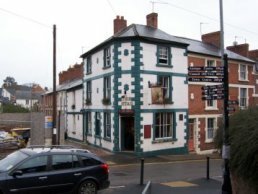 The Stag Inn on the corner of Henry Street and Crofts Lane. It used to be called the 'White Heart'. 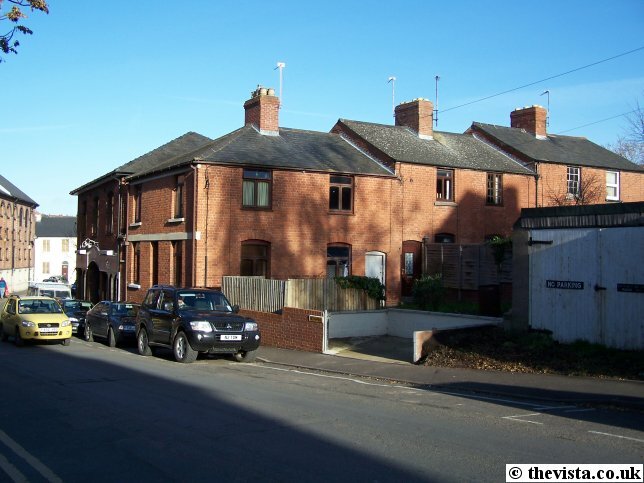 These are a few more houses on Henry Street. 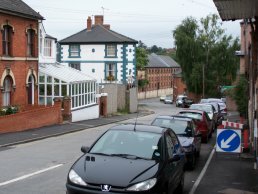 The entrance to the car park, marked by the "P" sign used to be the entrance to Kemp's builders yard. 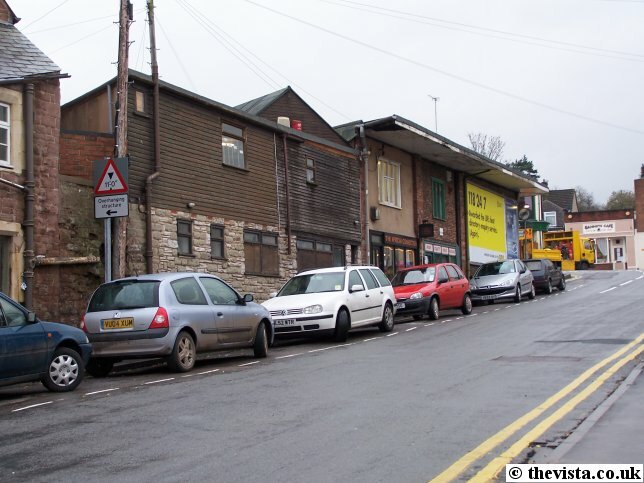 The car park that is here, is on the site of Kemps Timber, Slate and Tile yard. 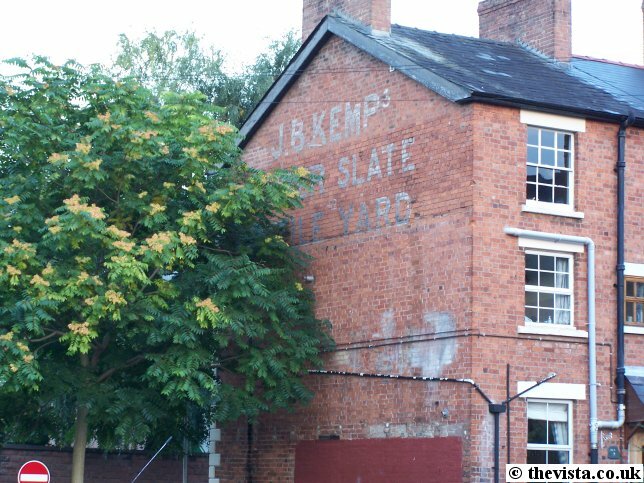 This opened in the last quarter of the 1800's and by sometime in the 1920's-30's, the yard had moved to Millpond Street with the saws being steam powered at first. I have seen photo's on other sites that show what seems to be this site in Henry Street burnt down, this may well bw what prompted them to move to Millpond Street. Then in 1975, this burnt down too and they constructed a new building which they used until they moved to Alton Road in the 1990's. 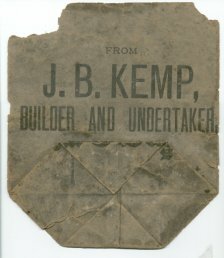 Here is a bag from the Henry Street Branch of J. B. Kemp's. The bag reads "From J. B. KEMP, Builder and Undertaker, Timber, Slate and Tile Merchant Henry Street Ross." This is the local Gospel Hall in Ross that is surrounded by the Sainburys (was Somerfield) car park. 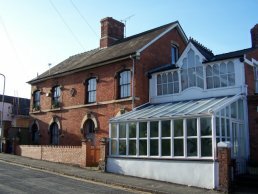 This was built in around 1866 by the Alton Court Brewery Company after the company purchased the site of the Plymouth Brethren meeting house on Station Street in order to build their own premises. 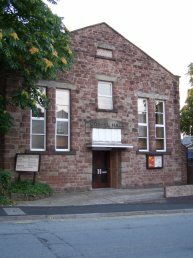 The Plymouth Brethren first came to Ross when Captain William Rhind rode, every Sunday after the morning service, from Hereford to spread the day's teachings from the steps of the Market House. Rhind was a member of a group of Military and Naval officers who had met in Plymouth to hold meetings in New Testament simplicity which became the Plymouth Brethren. In 1839 he moved to Hereford where he lived until he moved to Ross in 1843. At this time fighting in the street was not uncommon and Rhind would often be seen hurrying to the spot to break up the spectacle. Reputedly Thomas Griffiths, the champion fighter in Ross, was converted by Rhind's ways and he became a true believer and sometimes took part in services. 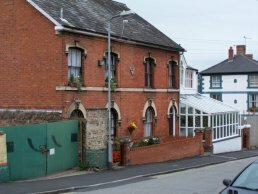 From 1844 the Brethren held their meetings in a room on Wilton Road. This held 130 people but this was soon too small and the room extended to hold 260 but still more room was needed. 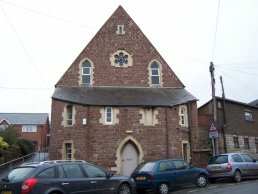 In 1856 a new, much larger, meeting house which held 400 people was opened in Station Street but in 1865 the Alton Court Brewery Company, as mentioned above, moved the hall to Henry Street which was completed in 1866 and this later became the Henry Street Evangelical Church. In 1863 Rhind died aged 68 and a service was held in the Station Street meeting house which was attended by Christians of all denominations. His body was then taken to Hereford by train for burial in a compartment lined with evergreen foliage as a mark of respect. 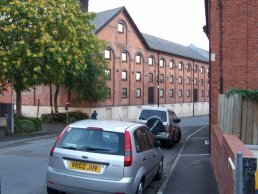 Behind these buildings is the site of the brewery stables and these are some of the other housing on Henry Street that were probably also related to the Brewery. Sainsbury's opened their new supermarket in Ross on Wednesday 14th July 2009 at 9am, the photo below was taken around 12 hours before it opened. The new signage and trolley parks are in place ready for the opening first thing. The building ahead is the Malt House again. 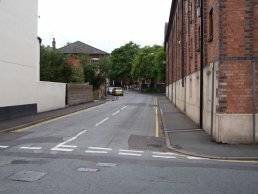 To the left is the lower exit of the car park and to the right is the site of the brewery stable and some associated housing. 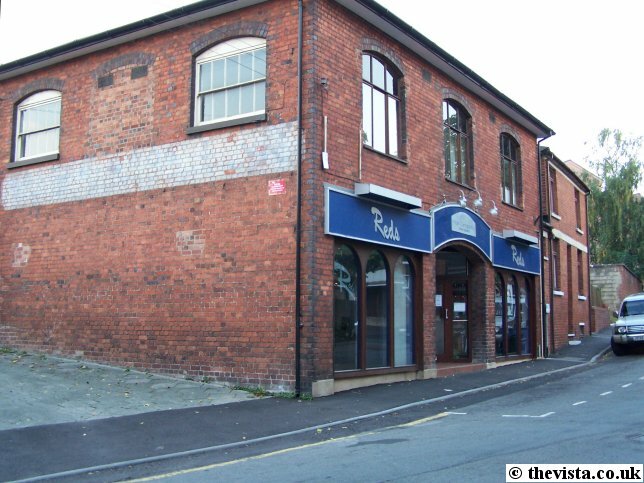 This building used to be the stable and dray store for the Alton Court Brewery. When I once visited the flat above, I was told that it used to be the hay store above the stables, and that in the loft space, some of the original pulley equipment used to lift the hay and straw up still exists. The view back up Henry Street south past the brewery buildings and towards Cantilupe Road.